Back in 1983 Dan Aykroyd and Eddie Murphy starred in a movie titled Trading Places. It’s been a few years, but maybe you remember the movie in which a snobbish rich man played by Dan Aykroyd gets switched with a street con artist played Eddie Murphy. They find themselves in the other’s shoes, trying to make sense of their differing situations. This proves especially difficult for Aykroyd’s character because he’s not used to having to deal with life on the streets. While his previous life had been relatively easy, now it was much more difficult! While the plotline for Trading Places doesn’t exactly parallel that of Lazarus and the Rich Man, there is in this parable a reversal of fortunes. In a real way they traded places. In the parable, Jesus tells the story of a rich man who lived in the lap of luxury, and who couldn’t be bothered with the needs of those less fortunate than him. On the other hand, there is a poor man sitting at his gate. He’s hungry and he’s covered with sores. Everything about this life is opposite to the other. If only a few scraps from the rich man’s table could reach him, he might satisfy his hunger, at least for a moment. It’s at death that the reversal of fortunes comes (not the result of a bet on the part of a couple of bored millionaires). While the poor man ends up in the heavenly realm in the company of Father Abraham, the rich man ends up in Hades, where he is tormented by intense and constant fire. You can see where the idea of the fires of hell gets its biblical support. Whereas the poor man experienced torment in this life, in the next it was the rich man. Most of us like to root for the underdog. So, when we hear this parable, we’re likely to side with Lazarus. It’s a good thing that he found the comfort in the next life that was never available to him in this life. As for the rich man, if you don’t think of yourself as being rich, then you may feel like this rich man got what he deserved. We middle class folk derive a certain satisfaction when the rich fall, even as we enjoy the opportunity to pity the poor. If you’re middle class, you can sit in between and feel as if the story isn’t about you, but is that true? For some of my compatriots, when it comes to taking care of the poor, that’s the responsibility of the rich. Tax them and take care of the poor. If we do that then the poor get taken care of, but my taxes will stay the same (or so I’d like to think). Besides, could it be that when Jesus envisions the rich man he had me in mind? This parable follows after the parable of the dishonest steward (Luke 16:1-13). Both parables speak to some degree about the role of money and wealth and how we handle it responsibly. In the earlier passage Jesus warns against falling prey to the idol of wealth. You can’t serve God and mammon both. You’ll have to choose, and it’s not an easy choice. In this second parable the pursuit of wealth and luxury lands the rich man in Hades. The reason doesn’t appear to be the wealth itself, but the way the man lived his life. He simply ignored Lazarus. The needs of the poor were irrelevant to him. As I read the parable and thought about its implications, I began to wonder if the embrace of philanthropy on the part of many wealthy people results from having heard this parable? Who wants to end up in Hades? If you can forestall that with a little sharing, isn’t that a good thing? What is interesting about this parable isn’t just the reversal of fortunes in the afterlife, but that Jesus also treats the characters differently. Did you notice that Luke gives the poor man a name (Lazarus), but fails to do the same for the rich man? I think this is intentional. It is worth pointing out that the name Luke chooses is also the name of the man Jesus raises from the dead in John 11. There are some interesting connections, but the Lazarus in John isn’t poor, or doesn’t appear to be. The rich man, on the other hand, the one who is dressed purple and fine linen, and gets to dine on a sumptuous feast every day while Lazarus lays outside his door, both hungry and sick (the neighborhood dogs come and lick his wounds), lacks a name. There are three primary characters. Two of them have names, but the rich man doesn’t. That’s another reversal of fortune, but since names are important, especially in the ancient world, tradition calls him Dives. Later interpreters may have felt sorry for him and figured if Lazarus had a name, then so should he. Jesus, however, didn’t think that was necessary! Returning to the parable, Lazarus is situated by the side of Abraham, who in first century Judaism was considered the patron saint of hospitality. Lazarus now enjoys what was withheld from him in life. The rich man is very aware of his own torment, but interestingly enough now that he is in torment he finally acknowledges Lazarus. He even knows his name. He requests of Abraham, that Lazarus be sent to dip his finger in water and bring some relief to his torment. The sense of superiority that was present in life, remains present in death. Abraham, however, refuses to let this occur. Things are as they are. The rich man, feeling some concern for his family, asks that Lazarus be sent to warn them (sort of like Jacob Marley is sent to warn Scrooge), so that they might repent. Abraham again refuses, suggesting that if they don’t listen to Moses and the prophets (the Scriptures), then why would they listen to the dead? This response raises an interesting question—is repentance possible for the wealthy? The answer should be yes, since we have other stories in Luke where the wealthy do repent (witness Zacchaeus). Contextually the parable is a reminder of God’s choice to bless the poor, that God is on the side of the poor, which is a reversal of fortunes. If we consider ourselves followers of Jesus, then how does his own sense of calling as the one who brings good news to the poor define our own sense of calling (Lk 4:18)? If we desire to be on God’s side, shouldn’t we follow Jesus’ example and side with the poor? Indeed, what does this parable say to those of us living in middle-class America? If Abraham is the patron saint of hospitality, what might this parable say to us about how we share the Table? Do we invite everyone, or only those who are like us? 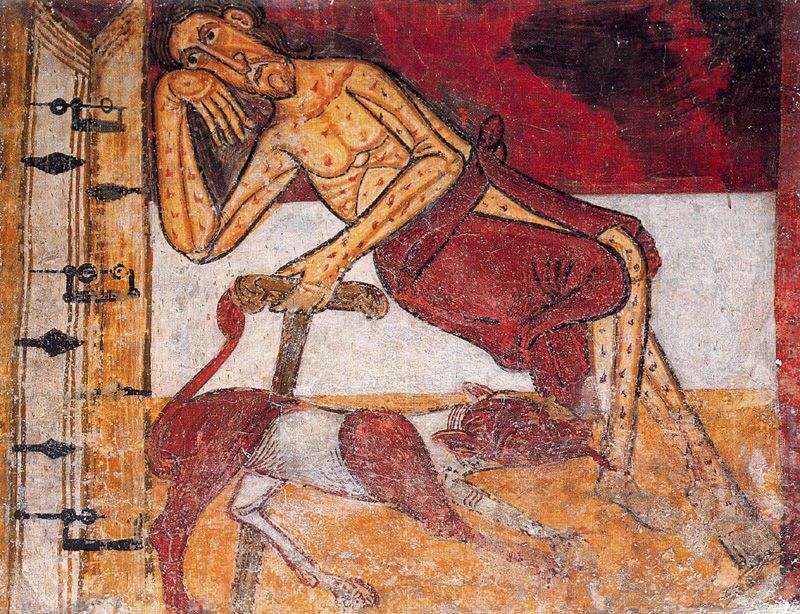 Picture attribution: Lazarus waiting at the door, from Art in the Christian Tradition, a project of the Vanderbilt Divinity Library, Nashville, TN. http://diglib.library.vanderbilt.edu/act-imagelink.pl?RC=55712 [retrieved September 19, 2016]. Original source: http://commons.wikimedia.org/wiki/File:TaullLlatzer.jpg.